Purchase tickets online by clicking the button above. For answers to your questions, call Argia Mystic Cruises at 860-536-0416. Please use the form above if you would like to email us. Our friendly staff is ready to answer your questions and help you to book your cruise. Take Exit 89 (Allyn Street/Hwy 614)*. Turn right off the exit if you are coming from I-95 North-bound and left off the exit if you are coming from I-95 South-bound. At the stoplight (1.3 miles), turn left onto US 1. If you wish to park for free at the Church lot, turn left immediately after the Church (part way down the hill) onto High Street. Otherwise, continue to the bottom of the hill and turn right onto Route 215/Water St. In half a block, turn left into the pay parking lot where you see the blue “P” signs (There is also a very large Mystic Museum of Art sign at the entrance). Once parked, follow the instructions in Item 1 or 2 below to check in. *State Tourism signage on I-95 for Argia directs you to take Exit 90 which is an alternate route that is much longer. If you take Exit 90, follow the tourism signage to Argia. You have two parking lot options. No matter where you park, please be sure that the person who purchased your tickets checks in at the ship or at our office with a picture ID at least 20 minutes before sailing time in order to obtain boarding passes for your party. Free Parking in the Union Baptist Parking lot (no Buses!) from 45 minutes before your cruise to 30 minutes after your cruise returns. Put a copy of your email confirmation (with cruise time visible) on your dash, or give us your license plate number when you check in for your cruise. This lot is 400 feet up the hill from our office. Enter "119 High St., Mystic CT" into your GPS. To reach the ship once you park, walk down Main St. to the Drawbridge. Our dock is on the right, immediately before the Bridge. You may check in AT THE SHIP with a picture ID to get your boarding passes from 30 minutes before your trip (the rest of your party may get in line before check-in if they like). *Please be aware that the Church lot is not available for parking during our 9:30 AM cruise on Sundays, or at any time during the day on May 24 & 25, or the afternoon of May 19. This will be a pay lot for Art Festival Aug 10-11. *If you would like to drop off members of your party at the ship or office prior to parking, you may enter the Downtown Pay Parking Lot to do this. The pay lot is free for the first 30 minutes. 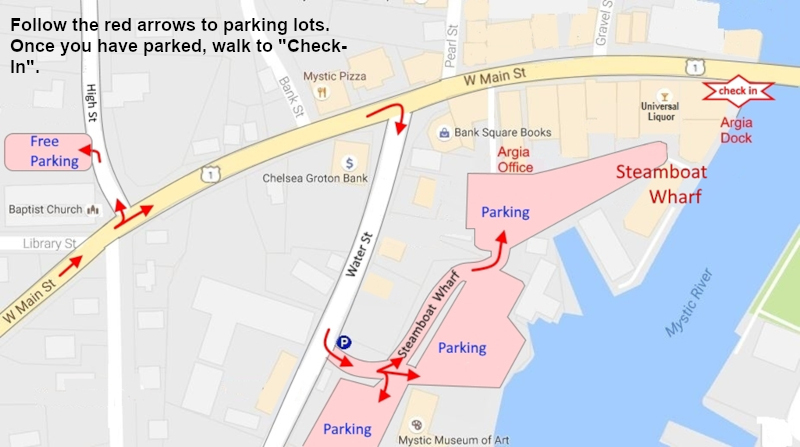 Mystic Downtown Pay Parking Lot. This lot is immediately adjacent to our office and ship. It is a credit-or-debit card system (no cash) that accepts Visa, MasterCard, American Express, and Discover. Enter "12 Steamboat Wharf, Mystic CT" into your GPS. There is a very large "Mystic Museum of Art" sign at the entrance to the lot. To reach the ship once you park, face the River and then walk to the left to get to Main St. Turn right down Main St. to the Drawbridge. Our dock is on the right, immediately before the Bridge. You may check in AT THE SHIP with a picture ID to get your boarding passes from 30 minutes before your trip (the rest of your party may get in line before check-in if they like). To request parking/drop-off info for Buses and Motorcoaches, please contact our office at 860-536-0416 or click here to use our contact form.